We, the Catholic Community of Saint Charles Lwanga Parish, are multi-racial, multi-cultural, service oriented Christian People. We are rooted in a commitment to Gospel and faith-filled worship. We are called by Jesus Christ to practice out faith, to welcome ALL people, and to serve the spiritual and human needs of the parish and neighborhood. We serve primarily the East End of Pittsburgh, including Homewood Brushton, Lincoln/Lemington, East Liberty, Penn Hills, and reach out to some homes in the suburbs of East and North. Father David H Taylor was ordained a priest for the Diocese of Pittsburgh in May 1974 and been serving as pastor of Saint Charles Lwanga Parish since 1992. He is also the pastor of Sister Thea Bowman Catholic Academy and was recently named Administrator of St James Parish in Wilkinsburg. He has served on the board of the Priest Council of the Diocese of Pittsburgh and the Board of Consulters. At the present time he serves on the Homewood-Brushton Council of Churches, the Advisory Board of the Allegheny County Agency on Aging, and the Board of Trustees of the Greater Pittsburgh Community Food Bank. Father Taylor also is an instructor of Theology at Duquesne University. 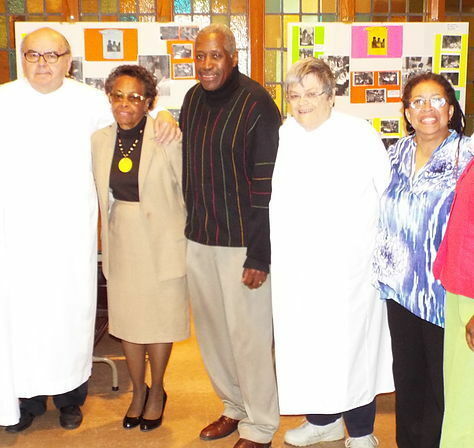 Father Taylor is the only African American Catholic Priest who serves in the Diocese of Pittsburgh and his ministry has been an anchor of faith in the East End of Pittsburgh, and beyond, for over 40 years. It all started in Lexington Kentucky where Father Taylor was born as the second son, one of nine siblings to Evelyn and Augustus Taylor. Father Taylor attended elementary and high school in Cincinnati. It was there he and his entire family converted to Catholicism. His older brother, Fr Augustus Taylor, entered the seminary in the Archdiocese of Cincinnati soon thereafter. Father Taylor attended the University of Cincinnati graduating with a Bachelor of Science Degree in Education and subsequently attended seminary at the Catholic Theological Union in Chicago securing the degree of Master of Divinity. He also holds an MA Degree from Duquesne University. While studying for the priesthood in Chicago Father Taylor had the opportunity to serve and minister in the African-American Community on the South Side of Chicago under the tutor leadership of Reverend George Clements, who was then pastor of Holy Angels Church. he also studied and took classes at the Chicago Center for Black Religious Studies and graduate courses at DePaul University in Chicago. Father Taylor continues to learn and grow and spread the word of God.